PHUKET: The Marine Chiefs of Krabi and Phuket have vowed to tackle dangerous speedboat operators in the wake of 18-year-old Chinese tourist Li Yuheng dying after the femoral artery in his left leg was slashed by a propeller at Phi Phi Island last week. “Despite all efforts to save him, Mr Li died at 11:23 pm on July 8 at Krabi Hospital due to the injuries he sustained after being hit by the propeller,” confirmed Lt Col Chaetpan Naruedon, Chief Investigator at Phi Phi Police Station. “Naradon Tongdee, 20, who started the engine, causing Mr Li’s injuries, has been charged with recklessness causing death. “The tour company’s insurance has paid about B2.3 million in compensation to Mr Li’s family, the tour company also covered the costs of the family’s visit to Thailand following the incident,” he said. Mr Li’s death follows the deadly collision of two tour speedboats off Phuket on June 8 that left two Chinese tourists dead and 34 other tourists injured. That incident, along with several fatal accidents off Pattaya, prompted a major push for marine safety improvements at the national level. 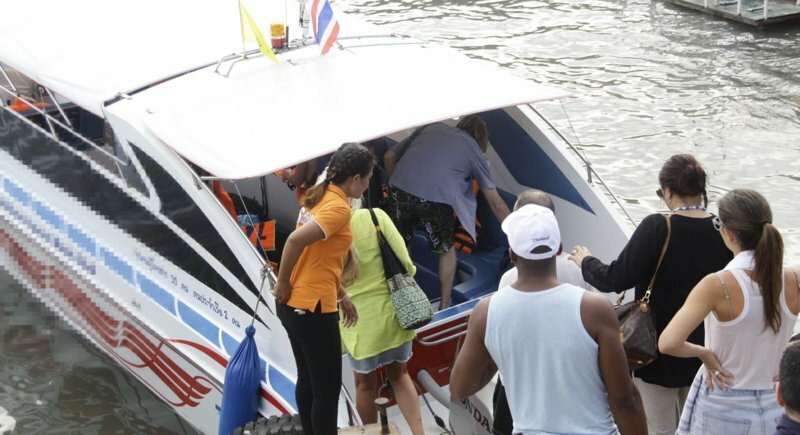 Tourism Minister Kobkarn Wattanavrangkul in Phuket on June 16 announced a raft of new measures to improve marine safety in Thailand (see story here), while the Tourism Authority of Thailand also on June 16 posted the new 10-point marine safety crackdown on its website. “We are focusing on the test knowledge and interviewing boat operator applicants,” Krabi Marine Chief Boonchaw Tangsiripaisan, who is responsible for vessels at Phi Phi, told The Phuket News. “They will get their license only when they have gained enough knowledge and pass the test, and we will be strict on checking our database records before issuing or renewing any licenses,” he said. Phuket Marine Chief Surachai Burapanontachai concurred. “We are very serious about this issue because this should not happen to anyone,” he said. “The crew acts under the responsibility of the boat operator. If anything happens, the Marine Act holds the boat operator responsible. The consequences will be on him. “Within two months, the Marine Office will issue new standards to boat operators which will also affect all crew,” he said. They wait until many tourists die before taking action which will have no real effect anyway. They only take action to look like they're doing something when in fact all they care about is the tourism dollar. Why must it always be a death of someone before authorities take serious actions? Yada,yada yada. Blah,blah blah. Yada,yada,yada. Blah,blah,blah. Some rudimentary first aid training should be included in licensing all operators of amusement features. I can't help thinking that a simple tourniquet, tied securely around the injured leg, as soon as the youth was lifted into the boat, MAY have saved him from bleeding out. Probably will last as long as the buoys at Patong Bay did!